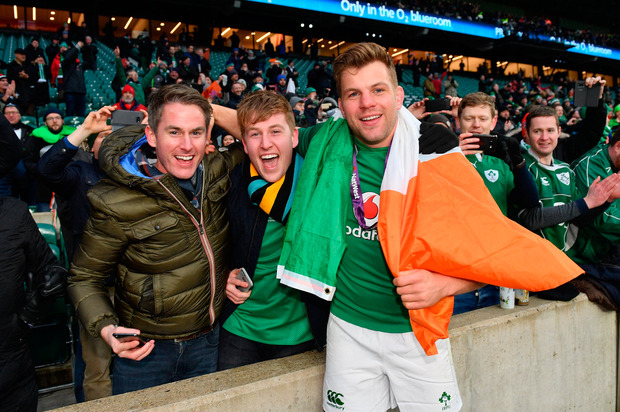 Ireland flanker Jordi Murphy is auctioning off the jersey he wore in the Grand Slam-winning match against England at Twickenham on St. Patrick’s Day, with the proceeds set to go to charity. Murphy will sell the jersey, which has been signed by the entire Ireland squad, to the highest bidder and has pledged to donate the money resulting from the sale to CanTeen Ireland, a support group for Irish teens aged between 12 and 15 who have suffered from cancer. The Leinster star, who will join Ulster at the end of this season, took to Twitter to promote the online auction and publicise the charity he has been involved with for a number of years. "Am auctioning off my jersey from England game on Paddy’s day. All proceeds going towards CanTeen Ireland. Incredibly worthwhile charity close to my heart. Please RT. Thank you," he wrote. Former Leinster centre Brendan Macken, who played with Murphy at Blackrock College pledged his support on social media also. "Big Jordi Murphy is auctioning his Grand Slam Winning jersey all proceeds going to CanTeen Ireland. A great charity very special and close to our hearts! Please get bidding!" he said. CanTeen Ireland organises trips to activity centres, hosts support meetings and holds fundraising events, including a Vegas themed casino night held annually in memory of a school-mate of Murphy’s who died of cancer in 2014.